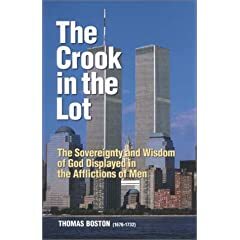 Thomas Boston continues his discussion of affliction (the crook in one’s lot) by defending the idea that it is a function of God’s providence. He works all things according to the counsel of his will (Ephesians 1:11). The biblical evidence for this idea of God’s sovereignty revealed in providence is overwhelming and I won’t dump all that on you. Boston provides additional distinctions. Some afflictions are “pure and sinless”. Though painful, they do not defile you. Such things would be poverty, infertility, disability and so forth. Such things are not necessarily one’s fault (some causes of all mentioned could be someone’s sin however- in that case they would be “impure sinful crooks”). The storm that killed Job’s children was pure & sinless. The theft of his livestock by the Chaldeans was impure and sinful. Sadly, sometimes we bring them upon ourselves. Romans 1:19ff talks about how God hands people over to sin, and their desires become progressively dark and destructive. “He justly withholds His grace, which the sinner does not desire, takes off the restraint under which he is uneasy, and, since the sinner will be gone, lays the reins on his neck and leaves him to the swing of his lust.” This sounds like what Mark Driscoll calls “Cruel Calvinism” in his sermon on Ruth 1. But Genesis 50 reminds us “20 You intended to harm me, but God intended it for good to accomplish what is now being done, the saving of many lives.” Driscoll has forgotten the aspect of concurrence in the doctrine of providence. Joseph’s brothers intended evil- the destruction of Joseph. Satan intended the evil of destroying the promise of Genesis 3. God intended the preservation of Joseph, his family and therefore the promise as channeled through Abraham and his descendants. So, I’m sticking with the Westminster instead of Driscoll’s “softer” view of providence with God granting ‘permission’. The big rumored trade discussions involving the Red Sox and the Colorado Rockies are interesting for a number of reasons. Some of them involve negotiation tactics as well as roster philosophy. Much is being made of Todd Helton’s drop off in production. Some of that surely has to do with his back injury and intestinal infection last year. Hard to swing a bat for power when your back hurts or you’ve lost some muscle mass due to illness. My back is finally recuperated from a fall in 2002 because I go to the gym and utilize machines that work those muscle groups. So the back issue might be resolvable, and the effects of the infection should be gone by now. Another issue is that the Rockies have just plain stunk the past few years, and Helton rarely sees a pitch worth hitting. That would change immediately in Boston. He also has great plate discipline, which fits the Red Sox hitting philosophy of wearing down pitchers and putting men on base to put more pressure on the pitching and defense. I’ve been listening to a message from the Acts 29 Bootcamp by Daniel Montgomery. This is the 3rd time I’ve listened to the Gospel-Centered Mess. There is some really good stuff in here to think about regarding the need for the leadership to live the gospel at home and church. I wish we were able to interview candidates with their wives more regularly to learn about their relational dynamic. He gives some good advice about being straightforward about the ways they deal with their sin apart from the gospel (Genesis 3). His influences include D.A. Carson, Tim Keller, Richard Baxter and Billy Graham. He also talks about some of the tough choices planters may have to make (my freedom to have a beer vs. the need for health insurance). He’s about keeping the main thing the main thing. At times it sounds “ungracious”, but so did Paul when he came across those who preached false gospels. The movie is “inspired” by a true story. How close it comes to the true story is something we aren’t sure about. The story was well-done, and entertaining, though no time is left for the resolution. The story takes place in 1981. There was a great clip of Reagan in the film with him shooting straight about the economic conditions as he began his presidency. I wish we had someone like him around instead of political hacks. Chris Gardner is a man watching his life get flushed. He made a business mistake that is costing his family lots of money, and he doesn’t seem to have many options. As a result, his marriage is crumbling. Chris has baggage- he didn’t meet his father until he was 28, and wants some thing more for his son. So, he takes a chance. This opportunity will be costly, but he believes this is the only chance he has. In the 3rd quarter Ellis Hobbs was flagged for a pass interference call. Yet, he did not touch the Colt’s receiver, Wayne, on the play. So, instead of it being 3rd & 7 on the 19 yard line, it was 1st and goal on the 1. The Colts got a TD and 2-point conversion. Analyst Phil Simms said it was face guarding, but the ref said pass interference. There was no contact, and should have been no foul. It’s just a bummer when bad calls affect the outcome of any game as important as the AFC Championship game. We don’t know what may have happened. But it probably would have taken more time, or possibly only resulted in a field goal which is 5 points less than the actual outcome, resulting in a Patriots win (unless the Colts got a 2 point conversion on the final touchdown). Human error is a reality, sometimes it is more significant than others. But we don’t know what would have happened without the error. Were it not for the God of providence, we would drive ourselves batty second guessing all of life. And that is just what many people do… sadly. Update: The NFL is basically saying there must have been contact, since there was a flag. Does the video show any contact? Doubt it- I thought it was a bad call then, and still do unless we see an angle that shows contact. I’m sure NESN would love to show the film of the contact. Today at 2 pm the Red Sox FINALLY had the press conference announcing the signing of the contract with J.D. Drew. It took over 6 weeks from the initial announcement of the deal by uber-agent Scott Boras to get the contractual language worked out. The Red Sox wanted some protection just in case his surgically repaired shoulder became an issue. Theo refused to address the language or specifics of the contract. The report is that if he loses enough time on the DL for injuries related to the shoulder in the 3rd or 4th year, the remainder of the contract is voided. That is similar to deals the Detriot Tigers worked out the Ivan Rodriguez (there is only 1 Pudge as far as I’m concerned- Fisk) and Magglio Ordonez (back and knee respectively). Drew’s issues are well documented. He refused to sign with the Phillies after being drafted by them. He finally signed with the Cards, spent time in Atlanta and last played for the Dodgers. He’s been hurt quite abit, but when healthy is a consistently good producers. He’s a very good outfielder. He is the anti-Trot, who was a fiery competitor. He wore his heart on his sleeve. Drew does not… and so people think he doesn’t care. He talks alot about wanting to play for a passionate community and win a championship. He cited Atlanta’s lack of interest in the Braves while he was there. Playoff games wouldn’t always sell out. In Boston… EVERY game is sold out. And with stronger starting pitching they have a shot to get back to the Series. With a consistently solid #5 hitter (which they lacked last year) they are that much better. Drew will not be expected to be the #1 or 2 guy, the focus on the offense. That is left in the more than capable hands of Big Papi and Manny, for whom part of Being Manny is driving in tons of runs.